Many children would smile and eagerly return those compliments, but some with social anxiety may be too terrified to respond. Researchers at the University of Central Florida’s Anxiety Disorders Clinic and the Atlanta-based company Virtually Better want to give more children with social anxiety the practice they need to become comfortable in social situations. 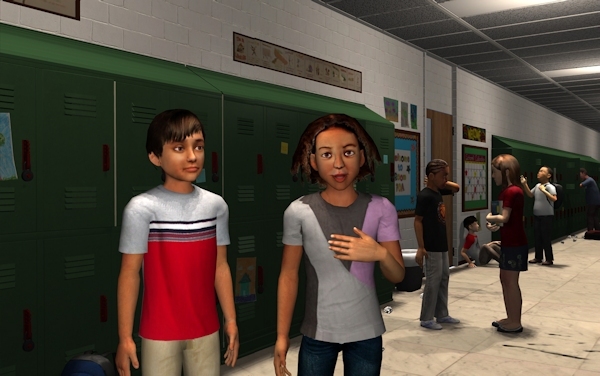 They have developed a new, one-of-a-kind computer simulation program that enables children to interact with avatars playing the roles of classmates, teachers and a principal. The simulation, designed for children ages 8 to 12, allows clinicians to play the roles of the avatars while the children sit at a computer in a different room and respond to situations they encounter routinely. The children practice greetings, giving and receiving compliments, being assertive and asking and answering questions. The National Institute of Mental Health, part of the National Institutes of Health, provided a $500,000 grant to fund the development of the software and a 12-week study that will begin this summer. Beidel and UCF doctoral student Nina Wong are looking for 30 children ages 8 to 12 with social anxiety disorders to participate in the free study. Participants will need to come to the UCF campus twice weekly. The study also will feature homework that children will do on either a home computer or a laptop that the research team will provide for free during the study. Parents or guardians who are interested in learning more about the study can call 407-823-4254. The research team will conduct short interviews to determine whether children qualify. Many children are nervous and slow to warm up in new social situations, but those with social anxiety disorders have severe distress that doesn’t go away, Beidel said. “If a fear is so severe that it prevents a child from doing something he or she should be doing, such as going to school, playing on a sports team, being in a dance recital, going to birthday parties or making friends, then a parent should call a mental health professional,” she said. Under Beidel’s leadership, the UCF Anxiety Disorders Clinic has treated children with anxiety disorders for five years. The clinic offers what Beidel calls the “gold standard” of treatments. Children with anxiety disorders are paired with socially comfortable peers for outings to places such as bowling alleys, restaurants and miniature golf courses. The new study will give parents multiple treatment options at UCF. But parents in most communities aren’t so fortunate. Many clinicians who treat children don’t have the time or resources to recruit socially comfortable children and organize regular outings. Guiding clients through a simulation in the office may be the only feasible solution for them. The simulation features a realistic school setting, designed with the help of elementary school teachers. The pre-programmed responses of the avatar classmates – which include a cool girl, a smart girl and a bully — were recorded by children to ensure the language reflects how they talk. “The most important thing is that this was designed by clinicians with a very specific intention to help people get better. That’s the big difference between this and a game, and there is nothing like this on the market,” said Josh Spitalnick, clinical psychologist and director of research and clinical services at Virtually Better, an Atlanta-based company bringing interactive technologies to behavioral healthcare for treatment and training. The six characters and the varying levels of difficulty in the simulation allow clinicians to design scenarios appropriate for their patients. More challenging scenarios include dealing with a bully who is demanding that a child give up some of her lunch money. If the initial trial goes well, researchers hope to conduct a yearlong trial with more children. If that is successful, the simulation could then become available to clinicians. The program eventually could be expanded to include other settings, such as playgrounds, and to serve other children who need help improving social skills. For more information about UCF’s Anxiety Disorders Clinic, go to http://anxietyclinic.cos.ucf.edu. For more information about Virtually Better Technologies, visit www.virtuallybetter.com.